An aspiring runner at The Sixth Form College, Solihull has been selected to run for Warwickshire in the UK Inter-County Cross Country Championships next month. Jessica Smith (aged 19, from Shirley) will be taking part in the championships on 11 March, representing Warwickshire for the first time. 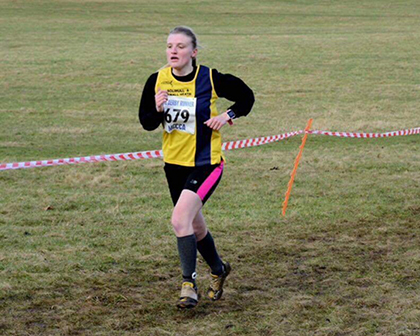 The ex-Light Hall School student was selected thanks to her performance at the Warwickshire County Cross Country Championships and the Midlands Counties Cross Country Championships, as well as for her club performances in local and national leagues. “I am a Triathlete mainly, but also a middle distance runner and I have only been doing both sports for around a year. I used to run when I was younger, an injury at the age of 13 stopped me and I couldn’t start back until I was 18! “In this past year I have been privileged to compete in many significant events such as the National Triathlon relays, Brownlee Triathlon and National Cross Country Relays, as well as many local competitions. I missed the qualification times to compete for Team GB age category in triathlon last year, but I hope to go for this again when I settle into university. Jessica competes for both Solihull Triathlon Club and Solihull and Small Heath Athletics club. Her main events are 800m and 1500m on track, as well as Sprint Distance Triathlons and Cross Country Leagues of 5 -8km in the winter. In the summer time, Jessica trains upwards of 15 hours a week and this can double in the holidays. She also juggles this training with her studies, as she is currently taking History, Geography and Politics at A level. She plans to study Geography and History at university when she leaves the College this summer.